This morning's Nintendo Direct was chock full of new Amiibo toys and Amiibo-enable games. Here's how the colorful pieces of plastic will work in Nintendo's upcoming titles, including the one you might have to delete existing Smash Bros. Amiibo data to play. First off we've got the toys: a newly-announced third wave of Smash Bros. Amiibo figures and a new set of Mario-specific Amiibo. The next Smash Bros. wave, coming this spring, features Lucina, Robin, Charizard, Pac-Man, Wario and Ness. As with all Smash Bros. series Amiibo, each of these will be able to become AI fighters in Nintendo's battle royale, while also unlocking random items in Hyrule Warriors. Lucina and Robin will also be joining Marth and Ike as unlockable characters in upcoming 3DS tactics game Code Name S.T.E.A.M, as it's developed by Intelligent Systems, makers of the Fire Emblem series from which those four characters originate. Nintendo also promised that more Marth Amiibo would be coming to North America to ensure he is available when the 3DS game releases on March 13. The new line of Mario-based Amiibo, due out on March 20, will largely feature previously-released Amiibo characters on new bases — Luigi, Mario, Princess Peach, Yoshi and Bowser — and one new addition in the form of good old Toad. With the exception of Toad, each Mario-themed Amiibo will feature the same functionality as its Smash Bros. counterparts, including the ability to function as AI fighters. Meanwhile, the Toad Amiibo will be able to hook up to Captain Toad's Treasure Tracker for the Wii U. TappingToad to the Wii U control pad will make a special pixel toad figure appear in each puzzle stage for Captain Toad to find. The main focus of the new Mario-themed Amiibo is Mario Party 10, which shares the wave's March 20 release date. Tapping any of the new Amiibo (or their Smash counterparts) to the Wii U control pad while playing Mario Party 10 will make that toy a playing piece in Amiibo Mode, unlocking a special character-themed board to play on. 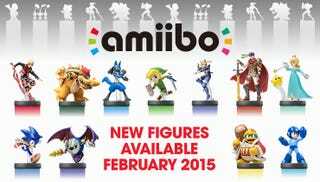 Smash Amiibo Donkey Kong, Rosalina and Wario will also work with the game. Along with unlocking game boards, players of Mario Party 10 will also be able to assign a power-up to their Amiibo to bring into the game. However, this is where the Amiibo data limit kicks in. Mario Party 10 and Super Smash Bros. data cannot exist on the same Amiibo. That's a real bummer. Collectors might not mind as much, what with new figures and new poses, but having to purchase doubles of at least Donkey Kong, Wario and Rosalina to have figures for both games is mighty inconvenient. Last, but not least, the Kirby, Meta Knight and King Dedede Amiibo figures will unlock special powers and masks once per day in the adorable Kirby and the Rainbow Curse for the Wii U, due out on February 20. There's some great new figures coming, and some interesting new functionality along with them. Just be wary — the more games that embrace Amiibo functionality, the higher the chances you'll need to clear your toy's data somewhere down the line.